Railpictures.ca - Michael Berry Photo: In the midst of a windy snowstorm, AMT 1328 leads EXO 60 into Montreal West Station. As all rolling stock is being rebranded EXO, the AMT logos that were once on the long hood of the locomotive have been removed. Interesting enough, a small ‘AMT’ has added to the right of the unit number, as AMT is still the reporting mark in use. | Railpictures.ca – Canadian Railway Photography – photographie ferroviaire Canadienne. 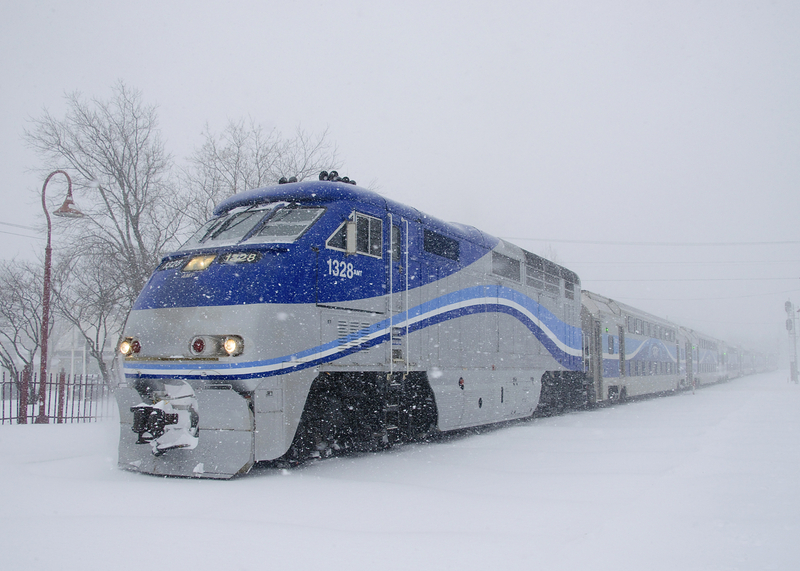 Caption: In the midst of a windy snowstorm, AMT 1328 leads EXO 60 into Montreal West Station. As all rolling stock is being rebranded EXO, the AMT logos that were once on the long hood of the locomotive have been removed. Interesting enough, a small 'AMT' has added to the right of the unit number, as AMT is still the reporting mark in use.